Last month, I shared my review for OPI’s first-ever pigmented top coat collection, Sheer Tints by OPI. They are neat because you can wear them on their own or over top of your favourite nail lacquer to add an extra dimension of colour. They come in four hues: blue, pink, yellow and purple. It goes on transparent with a splash of colour adding a beautiful glossy finish to your look. I’m Never Amberrassed: Liquid amber morphs into a veneer of yellow tint that is anything but bashful. Be Magentale with Me: Give your nails the sweet treatment with this sheer pink tint. Don’t Violet Me Down: You can count on this crystal sheer amethyst. I Can Teal You Like Me: It’s obvious you’re head over teal in love with this sheer blue. You can have a lot of fun with this new collection creating your own unique looks. 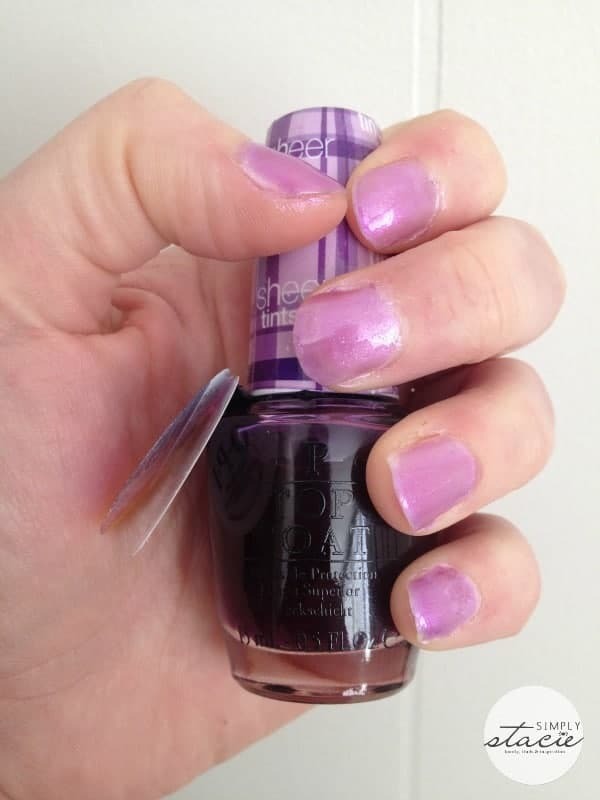 Sheer Tints by OPI are available in professional spas and salons across Canada for an SRP of $10.95/each. I would love to try the Don’t Violet Me Down. Sounds like this would certainly add a bit of punch to my nails. I love the teal, it’s gorgeous! I love the Be Magentale with Me! I like the Don’t Violet Me Down. These are pretty interesting. I like the I Can Teal You Like Me sheer tint. Don’t Violet Me Down is my favorite color. Be Magentale with Me would be my fave, but I’d try them all! I love them all, but I think Be Magentale with Me would be my favorite. OPI makes such wonderful products. I have used them for years. A friend got me hooked on them. My fave color has to be Be Magentale with Me! I love the Don’t Violet Me Down. I really like the purple tint. I Can Teal You Like Me! I can teal you like me is so cute!